MIKE Lorenzo-Vera stormed to the top of the Open de Espana leaderboard after a punishing day three at Real Club Valderrama. The Frenchman finished Saturday one over par overall as the brutal course tested the players’ mettle. Pablo Larrazabal, the morning’s leader, endured a frustrating afternoon, finishing on seven over par for the day after carding a level-par 71 on Friday. But with Martin Kaymer, Andrew Johnston and Joost Luiten lurking on two over, the scene is set for a fascinating showdown at this storied course. At the start of the day only five players were at par or better, a grim testament to the firm greens and deceptive winds at this former Ryder Cup venue. Richard Bland, looking for his first European Tour title, set out his stall with a glorious 30-yard putt for a birdie on the par-five fourth hole. Kaymer scored his second birdie of the day at the fifth as he hauled himself into contention on the leaderboard. And the German signalled his intent with two more birdies at the 10th and 11th to keep up the pressure on Larrazabal and Johnston. Sergio Garcia, meanwhile, was way off the pace, only bagging his first birdie of the day on the 13th to go three over. 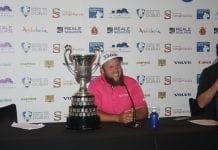 The chasing pack demonstrated their menace with defending champion James Morrison sweeping in a sensational birdie on the 10th, and Lorenzo-Vera’s chip from the rough one of the shots of the day. The final nine holes saw an endlessly-shifting leaderboard as players jockeyed desperately for position. Despite being two over for the day, leader Larrazabal was the only player under par when he reached the halfway stage. But after dropping a shot on the 11th, the Spaniard ceded the leadership to Johnston, who birdied the same hole. Larrazabal threw down his putter in disgust after shooting a double bogey at the 12th as Bland and Lorenzo-Vera leapfrogged to the top of the leaderboard. Larrazabal’s first birdie of the day steadied the boat, but he was shaking his head after teeing off straight into the rough on the 14th and hitting another double bogey on the 16th. Lorenzo-Vera hauled himself to the top of the leaderboard on one over, before the dogged Bland leapfrogged him to take control on the 15th. But an astonishing 50-yard approach shot from Lorenzo-Vera spun back into the 17th pin for an eagle as the Frenchman punched the air in delight. A triple bogey from Bland left him high and dry, with the Englishman finishing five over. Kaymer is still very much in contention after signing off for 71 and Johnston’s 74 card means the Englishman is within striking distance. Luiten and Swede Alex Noren were the only two players to card below par rounds as Valderrama once again proved to be an unforgiving venue. But it’s Lorenzo-Vera who sits in pole position tonight as he sets his sights on his first European Tour title. Next articleCooked to a tee at La Cala Resort!